The street here is fairly wide, with room to park along the curb near the local drug store. The street is lit by the street lamps that are hung with baskets of flowers and seasonal banners that all have Mythic Wood and Cedar Street on them in this area going down the road. There is a small official parking lot off to one side of the building as well. 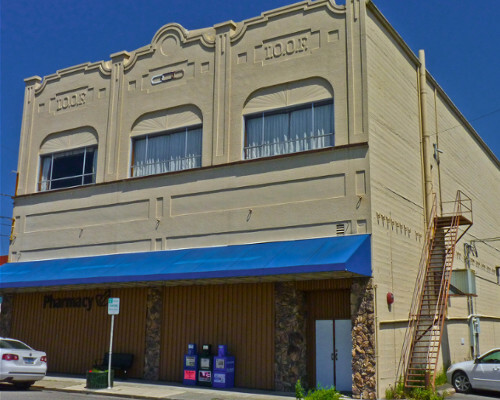 The drug store itself is tall and taupe painted stone building with a blue awning that stretches across its front. Its glass doors are kept clean save for a practical and simple sign that shows the shop hours. A local based drug store this shop while small is neatly organized and kept extremely clean. White tiles cover the floors and the walls are painted white as well giving the room a light and spacious feel. Evenly spaced rows of shelves holding various over the counter medicines are organized based on what they treat. In addition to typical medicines, there are several teas and herbal remedies for sale and there is even a small section dedicated to specialty soaps and beauty products. A counter is placed near the door for checkout. A staircase at the back of the drug store leads up to the rather spacious apartment that's located above the business. The walls are painted a simple soft cream color, the floors are polished pine wood. Several large windows in the living area give the main part of the apartment a very open, airy, and welcoming feel. A small entrance foyer serves as a place to remove and store coats and shoes before leading into a well-furnished living room. A large couch and matching chair upholstered in forest green are placed in front of a decent sized television that's mounted on the wall. The living area also doubles as a dining area, a pine table with four chairs sits a few feet behind the couch. An arch on one side of the room leads to a well furnished and modern looking kitchen while three doors lead to a bathroom, guest bedroom and master bedroom. This master bedroom has a soothing and almost earthy feel to it. Polished pine flooring is partly covered by a thick green shag carpet and the walls are a creamy off white that gives the room a light feeling. A large king sized sleigh bed with a pine frame is covered with a comforter, sheets, and pillows all in various shades of brown and green. A door off to one side of the room leads to the master bathroom and beside that door is a large pine dresser designed to hold the clothes of the room's occupants. This bedroom is fairly small all things considered. The pine flooring and pale blue walls do much to create an open feeling here. The bed is pushed against one wall and piled high with pillows and blankets. The colors used on the bedspread and pillows are largely greens and blues, though the hues of those colors vary greatly. A wardrobe for clothing is placed near the wall by the door along with a full-length mirror.